With seven points in two weekend games, 2019 recruit Trevor Zegras earned USHL Forward of the Week honors. 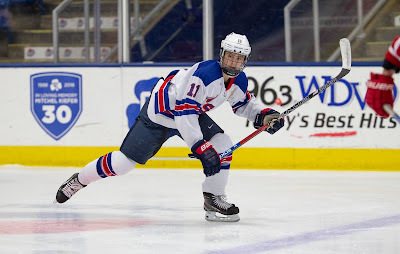 The 6’0” left-shot forward from Bedford, NY is on a scoring tear with 16 points (5G,11A) in his past seven games, including three assists in a recent exhibition game against the Terriers. With 19 points overall, he's second on the U18s in scoring and first in points-per-game. On Saturday, Zegras has a goal and three assists in an 8-3 win against first place Muskegon. Fellow recruit Alex Vlasic assisted on Zegras’ goal. 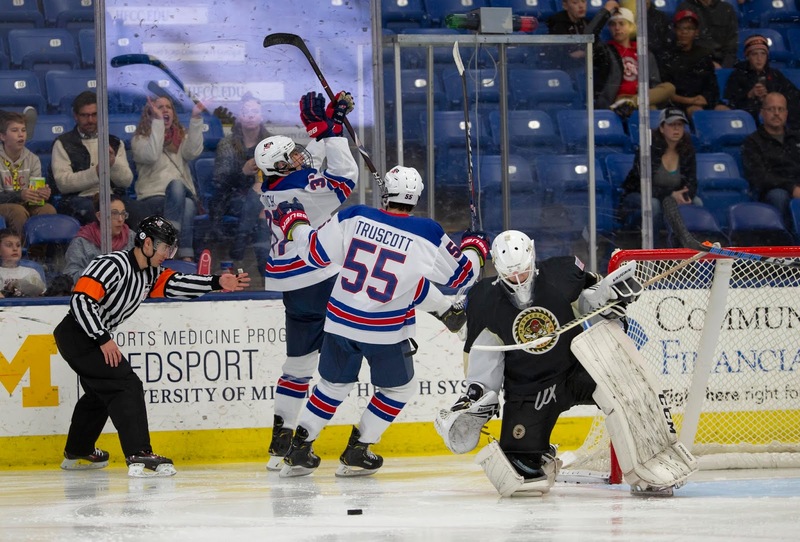 The next night against Dubuque, Zegras scored his sixth goal and added two assists, while fellow recruit Case McCarthy had a goal and an assist. 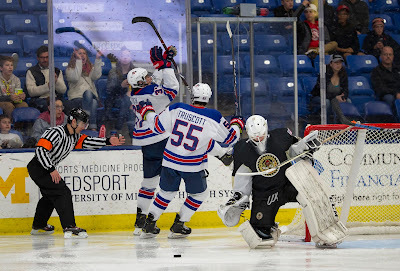 2019 recruit Robert Mastrosimone scored twice, including the overtime game-winner on a breakaway, as USHL Chicago defeated Cedar Rapids, 4-3. He leads the Steel in scoring with 10 points (6G, 4A). 2019 recruit Ethan Phillips record two power-play assists in Sioux Falls’ 4-3 overtime loss to Sioux City. In his four games over two weekends on loan to the Stampede, Phillips had two goals and four assists, including one game-winning goal and an assist on another. 2021 recruits defenseman Roman Schmidt (Don Mills Flyers) and center Danil Zhilkin (Toronto Marlboros) are ranked #4 and #5 respectively for the 2019 OHL draft by Prospect Pipeline. Jordan Greenway scored his first NHL goal, assisted by Charlie Coyle, in Minnesota’s 5-2 loss to Vancouver. Greenway, who signed with the Wild following his junior season at BU, had been recalled from the AHL on Sunday, one day after scoring a hat trick for the Iowa Wild in their 6-1 win against Colorado. Rodrigues’ wife Christina delivered son Grayson Michael yesterday. Everyone is healthy and happy. ERod positively beaming. Expect some new dad strength when he gets back in. Terriers dropped a 2-1 decision to #8 Northeastern Sunday at Matthews Arena. After BU had a goal disallowed, the Huskies took a 1-0 lead late in the first period and doubled the lead early in the second period. Nara Elia scored for BU in the final minute. 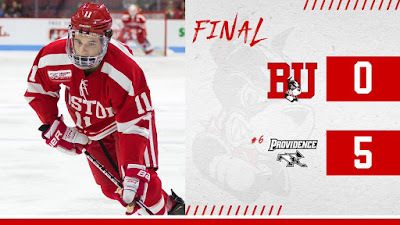 Terriers suffered their second consecutive shutout, tumbling to #6 Providence in their season home-opener at Agganis Arena. With the loss, BU fell to 0-4-0. BU dominated territorially throughout the first period aided by three power plays, but still trailed 1-0 after a fluke goal in the game’s first minute. PC’s Jack Dugan won a puck battle behind the Terrier goal and banked the puck in off Jake Oettinger’s pad. Brandon Duhaim wristed a shot past a screened Oettinger at 6:46 of the second period soon after the BU netminder had made a sensational stop during a Friar power play. PC was on the man-advantage again late in the period when Spencer Young rang a shot home off the iron for a 3-0 lead. Duhaime’s second goal, 42 seconds into the third period, and Kasper Bjorkqvist's power-play goal four minutes later closed out the scoring. BU had only 18 shots during the game, with half coming in the final period. 2019 recruit Ethan Phillips scored his second goal in three games and later assisted on the game-winner as Sioux Falls edged Sioux City, 3-2. The right wing for Selects Hockey Academy 18U is on loan to the Stampede again this weekend. 2019 recruit Vinnie Purpura stopped 26 shots for Omaha, but the Lancers fell to Tri-City in a shootout, 3-2. 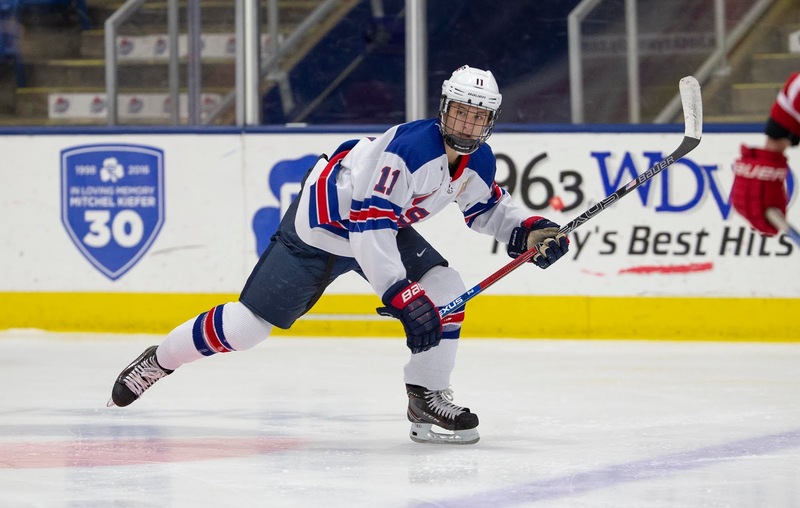 2020 recruit Luke Tuch scored a shorthanded goal, his fifth of the season, but the NTDP U17s fell to the USHL’s hottest team, Muskegon, by a 7-2 margin. Fellow recruit Drew Commesso stopped 31 of 37 shots. Matt Nieto scored his second goal of the season as the Avalanche roared back from a 3-0 deficit to defeat Ottawa, 6-3.